I’ve been dying to show you this project, but didn’t want to give away any secrets. You see, I made them for a few bloggers out there in the home décor blogland. And as luck would have it, most of these special women are here at Blissdom! As a tiny token of my appreciation for their inspirational blogs, I put together a little gift bag. Inside (among other things) was this one-of-a-kind memo pad. Get it? The notepad holder is a mousetrap and I was playing on the word, mouse (the one for your computer). Corny, I know. So, you want one for yourself? I’m happy to share with you the tutorial. The memo pad started life as a mousetrap (4 for $1) and a mini picture frame also $1 at the Dollar Store! Start by removing the hook and trap hold parts with pliers. Then remove the bait hook. All that will remain is the spring and snapping bar. Cut the excess wood from your mousetrap with a handsaw. You will need to cut down your scrap wood to the dimensions below. The 4.5″ square piece is the same thickness as the mousetrap. This insures an even surface for the memo pad to rest on. I wet each piece of wood and then added the glue. Glue the 4.5″ square piece to the bottom of the larger piece of wood. Then glue the mouse trap right above the square piece. Make sure your snapping bar is facing down, as shown below. Anyone know what these hand weights are good for? Beats me, I only use them to weigh down projects. After the trap is dry, spray your boards with 1 or 2 coats of primer. Then follow up with your favorite color paint. At this point, you will want to drill a hole through the top of your board. Take apart your picture frame and discard the backing. Replace it with a piece of corrugated cardboard cut to size. Slide in your picture. Carefully add a small line of E-6000 glue* to the back of the frame and glue it just above the mouse trap. If you use too much glue, it will glue the cardboard to the frame and you won’t be able to switch out your picture from time to time. *You could use Gorilla glue for this step, but the glue expands and might glue your frame shut so you can’t change the pictures. Create a bow with the ribbon and slide a piece of wire through the bow knot. 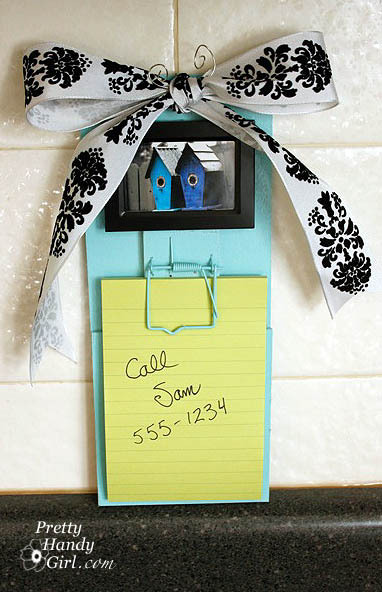 Secure the bow by threading both ends of the wire through the hole at the top of your mouse trap memo holder. Twist the wires together to make a loop for hanging. Add your memo pad and you have a unique little note center. So do you think those wonderful bloggy ladies will like it? Adorable! What a fun gift to give! What a thoughtful idea- I'm sure the sentiment will be long-remembered! Such a cute and thoughtful idea! And I was seriously incredibly honored and blessed by your giftbag. Made my day girl :)! Those are totally cute!! Love them! How cute! That was so nice of you to make gift bags for so many! I'm sure they all love it. This turned out to be so precious! The girls had to love this gift! You are a clever girl! Love the play on words. I now the ladies receiving these will love them. That's so clever! I love that you built a better mousetrap. =) Thanks for the how-to, I'll be linking. Holy cow – GENIUS! My sisters, mom and I are soooo making these. Who would have thought that a mouse trap could be so CUTE! Will have to try this for little Christmas gifts for a group I am in!